Snowmass Came and Passed. What have we learned from it? Skyline of Minneapolis, home of the University of Minnesota and host city of the Community Summer Study 2013: Snowmass on the Mississippi. Science is big. It is the systematic study of nature, so it has to be big. In another way, science is about asking questions, questions that expands our knowledge of nature just a bit more. Innocuous questions like, “Why do apples fall to the ground?”, “How do magnets work?”, or “How does an electron get its mass?” have lead to understanding much more about the universe than expected. Our jobs as scientists come down to three duties: inventing questions, proposing answers (called hypotheses), and testing these proposals. As particle physicists, we ask “What is the universe made of?” and “What holds the universe together?” Finding out that planets and stars only make up 5% of the universe really makes one pause and wonder, well, what about everything else? From neutrino masses, to the Higgs boson, to the cosmic microwave background, we have learned much about the origin of mass in the Universe as well as the origin of the Universe itself in the past 10 years. Building on recent discoveries, particle physicists from around the world have been working together for over a year to push our questions further. 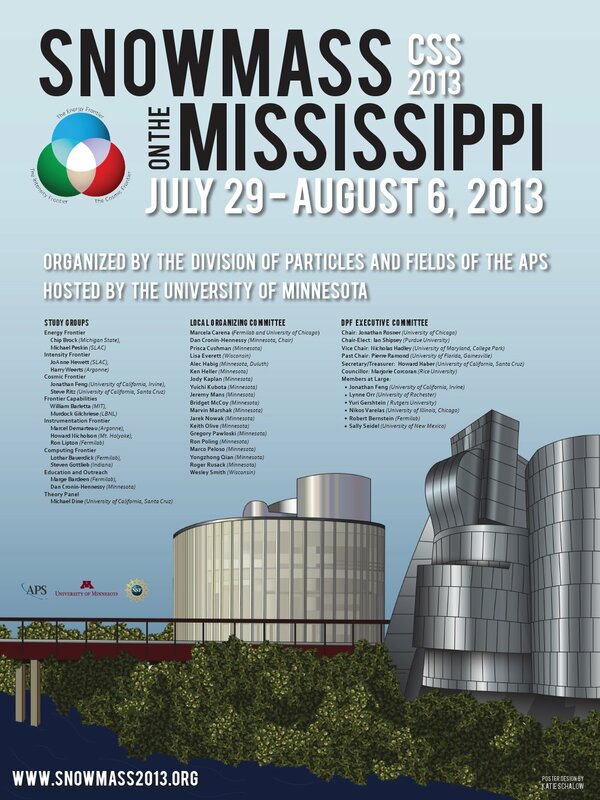 Progress in science is incremental, and after 10 days at the Community Summer Study 2013: Snowmass on the Mississippi Conference, hosted by the University of Minnesota, we have a collection of questions that will drive and define particle physic for the next 20 years. Each question is an incremental step, but each answer will allow us to expand our knowledge of nature. Summary presentations of all the work done for Snowmass are linked below in pdf form and are divided into two categories: how to approach questions (Frontiers) and what will enable us to answer these questions. These two categories represent the mission of the US Department of Energy’s Office of Science. A summary of the summaries is at the bottom. What is the absolute neutrino mass scale? What is the neutrino mass ordering? Is CP violated in the neutrino sector? What new knowledge will neutrinos from astrophysical sources bring? What is dark matter? What is dark energy? Why more matter than anti-matter? What is the physics of the Universe at the highest energies? Where are the new particles that modify the Higgs, t, W couplings? What particles comprise the dark matter? Why is the Higgs boson so light? Is dark energy a cosmological constant? Is it a vacuum energy? From where do ultra high energy cosmic rays originate? From where do ultra high energy neutrinos originate? How would one build a 100 TeV scale hadron collider? How would one build a lepton collider at >1 TeV? Can multi-MW targets survive? If so, for how long? To provide a conduit for untenured (young) particle physicists to participate in the Community Summer Study. To facilitate and encourage young people to get involved. Several great posts from QD (Family, Young, Frontierland), Symmetry Magazine (Push, Q&A, IceSlam, Decade), and even real-time updates from QD’s Ken Bloom (@kenbloomunl) and myself (@bravelittlemuon) via #Snowmass are available. All presentations can be found at the Snowmass Indico page. Until next time, happy colliding.